Burgoyne Construction Ltd. has started an estimating / job site visit fee back in the summer of 2017. This fee will be deducted from the last invoice when we have completed the project. A lot of the people that contact us are in agreeance with this and say that it shows that we are both serious about the project. This is a one time charge if we get the job, and you will not be charged on the future times you call us. We will try to have it linked to our webpage so all the info will be the same on both pages. That way you will be able to find me on the net and on Facebook. This is our business card since 2007 since we first opened. Please stop by and like our page. 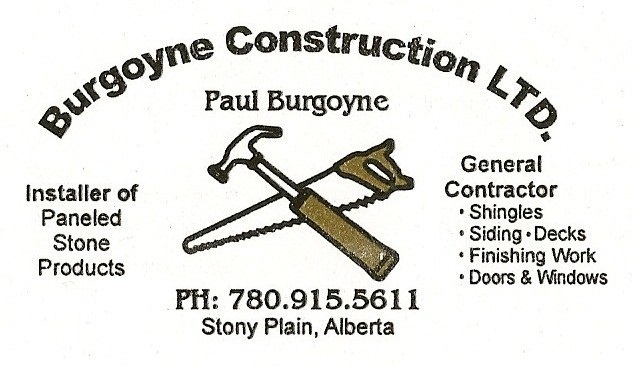 We do Construction Services in the Parkland County, Stony Plain, Spruce Grove area. We repair your house when in need, like Patio, Railing Repair, Verandah, Railings, Aluminum Railings, Wood Railings, Glass Railing, Windows & Doors, Patio Doors, Bifold Doors, Baseboard & Trim, Door Casing, Window Trim, Basement Renovations, Basement Repairs, T-bar Ceilings, Ceilings Tiles, Sheds, Shed Repair, Shed leveling, Garages, Additions, Drywall, Drywall Repair, Painting, and anything that is made of wood.